U.S. EPA released its final RVO rule Nov. 23. Advanced biofuel is up 19 percent from 3.61 billion gallons in 2016 to 4.28 billion gallons in 2017, and up 280 million gallons from its proposal, while biomass-based diesel for 2018 is up 100 million. The GAO issued two reports on how the RFS is unlikely to meet its targets for reducing GHG emissions and expanding advanced biofuel production. The biofuel industries can attribute this shortfall back to the federal government in various ways. BASF is introducing a new version of its Lutropur brand of methanesulfonic acid (MSA) with higher active concentration for multiple applications in biodiesel and ethanol processing. 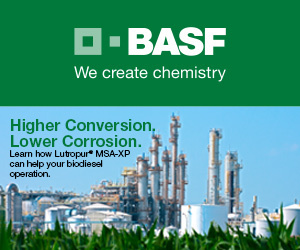 BASF's new Lutropur MSA-XP features 94 percent active concentration. A leaked draft of annexes from the EC's revised Renewable Energy Directive shows that fuels produced from food or feed crops, such as sustainable biodiesel from rapeseed oil, will continue to serve a role in the post-2020 EU transport fuel sector. The U.S. EPA has published a notice in the Federal Register proposing to deny several petitions requesting the agency redefine the point of obligation under the renewable fuel standard (RFS), officially opening a 60-day public comment period. Cielo Waste Solutions has agreed to buy the former Western Biodiesel plant in High River, Alberta, near Calgary. Once the purchase is complete, CWS plans to scale up its thermal catalytic depolymerization technology there to produce renewable diesel. On Nov. 16, U.S. EPA's proposed Renewable Enhancement and Growth Support rule was published in the Federal Register, officially opening a 60-day public comment period on the proposal. Comments are due Jan. 17. EPA first released the proposal Oct. 3. Biodico announced Nov. 29 it made its first delivery of biodiesel to the University of California, Santa Barbara. The biodiesel produced from used cooking oil collected at the university will fuel tractors and other diesel-powered equipment at UCSB. Renewable diesel will power heavy-duty vehicles in Hamburg airport’s ground fleet, complementing other alternative energies used on-site, making it the first major international airport to replace all fossil fuels with renewables in its entire fleet. The Chicago Park District and the Forest Preserve District of DuPage County are the newest members of the B20 Club, funded by the ISA checkoff program to support biodiesel use. ISA sponsors the B20 Club with the American Lung Association in Illinois. Renewable Energy Group Inc.'s board of directors authorized a review of strategic alternatives for its Life Sciences subsidiary, which develops renewable chemicals and fuels with its proprietary microbial fermentation process. NBF directors held their Nov. 14 board meeting where they nominated and elected Jeff Lynn, Illinois Soybean Association, as president; Mark Caspers, Nebraska Soybean Board, as vice president; and Lindsay Fitzgerald, REG, as secretary/treasurer.